These fine George V cut and etched glass antique cologne bottles have a cuboid form with chamfered corners. 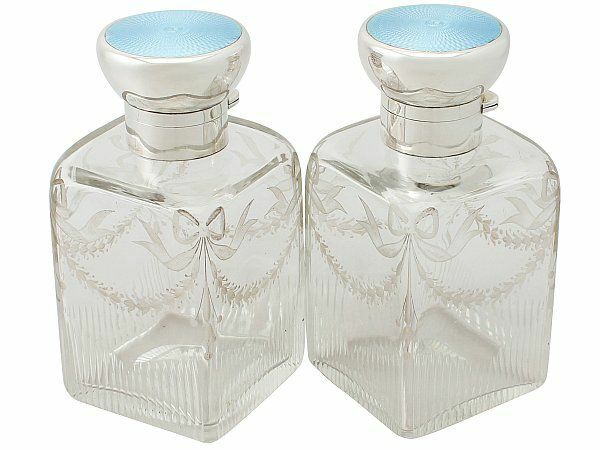 Each bottle is fitted with a plain cylindrical sterling silver hallmarked mount with an impressive hinged circular cover embellished with a pale blue guilloche enamel panel. The cover of each opens to reveal the original fine and impressive glass stopper and gilt interior. The lower portion of each glass body is embellished with impressive arched cut glass decoration. The upper portion is ornamented with acid etched ribbon bows to each corner accented with pensile stylised bud decoration and suspended festoons. The underside of each bottle features a subtly concave plain circular ornamentation to the centre. These antique cologne bottles are a very good gauge of silver, fine quality and in excellent presentation condition. The enamel and glass are in perfect condition; there is some minor surface wear to the rim of one enamel panel, which does not detract from the aesthetically pleasing appearance. Full hallmarks struck to the surface of the mount of each bottle and part hallmark to surface of the covers are all very clear; the maker's marks are rubbed due to their location and in keeping with age, but remain legible.